If you have a bunch of speaker wires you need to sort out, the most difficult and time-consuming way is to untangle the wires one by one, following each length all the way back to the speakers. When you factor in having to navigate around all the power and connection cables to other pieces of equipment, this process can turn into an all-day chore. There's an easier, smarter way to trace the wires in a fraction of the time. All you need is a common household battery (a fresh one, preferably), such as an AA, AAA, or a 9-volt battery. Don't use anything bigger than these. While you're at it, grab some masking tape and a pen so you can label the wires as you go along. If you have speakers located in other rooms (particularly with whole house or multiroom audio systems), you might want an assistant to help you watch or listen. Turn off all equipment before you begin. Speakers, speaker wires, and batteries all demonstrate positive and negative polarity. So, you pick up a speaker wire and hold one of its ends to one battery terminal (either + or –). Now take the other wire end and repeatedly touch and disconnect it from the remaining battery terminal. This is best performed as a gentle brushing motion. 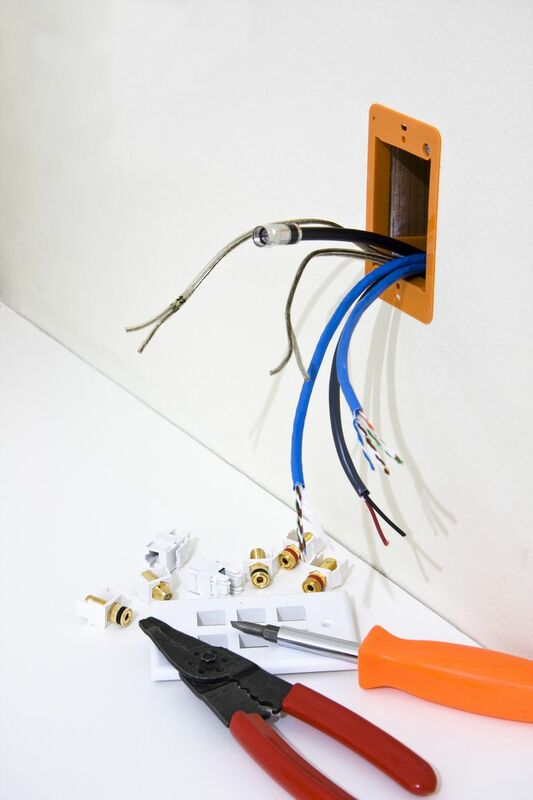 If the speaker is working and connected properly, you'll hear static or a thump sound from the speaker each time you brush the wire against the battery terminal. Current from the battery causes movement in the speaker's drivers. Now that you know which speaker you're working with, identify the correct polarities of the wire. Many speaker wires have color-coded jackets or markings to show polarity. You want to make sure that the speaker is "in-phase," a state where the positive and negative terminals match up when connected to your stereo receiver/amplifier. While out-of-phase connections won't damage the speakers, in-phase connections ensure the best performance. If the wires don't provide any clues to polarity, you can figure out which is which by the way the speaker moves. Observe the cone each time you brush the wire against the battery. If the cone moves out then in, the polarity is correct. If the cone moves in then out, reverse the wires on the battery and test again. These movements can be subtle (particularly with small or high-frequency drivers), so good lighting and a keen eye certainly help. Take extra care if you bi-wire or bi-amp your speakers since you have twice the connections to deal with. After you've identified the speaker and polarity of wires, use the masking tape and pen to label it for future reference. You should also include the location (living room, bedroom, garage) and the speaker channel (left, right, center, surround) on the label. If you don't hear anything from a speaker, check the wire connections on the back of the speaker to make sure they're firmly set. Use a fresh battery and only briefly touch the wires to the battery when you're testing, otherwise, the battery can drain quickly. If you still hear nothing, the problem may be a defective speaker or defective wire between the amplifier and the speaker. Connect some working speaker wire to the unresponsive speaker. If the battery trick still doesn't produce sound or movement of the speaker cones, then the speaker may be defective. You need to investigate further as if you're troubleshooting when one speaker channel isn't working. If the battery test does work, this likely means that the original wire is the problem. You'll have to carefully check the entire length of the wire in question since even a small break can lead to problems. If you're dealing with a subwoofer, you'll have to address a few additional steps to troubleshoot when your subwoofer isn't working. Subwoofers don't always connect the same way that typical stereo speakers do.